An editorial reshuffle at the Kent Messenger has led to the appointment of the first female editor in the title’s 152-year history. Denise Eaton, left, moves from her current role as editor of the group’s Gravesend and Dartford Messenger Series. Meanwhile Bob Bounds, who currently oversees both the Kent Messenger and bi-weekly sister title the Medway Messenger, will continue to edit the Medway title while taking on Denise’s old role in Gravesend. Under Bob’s editorship, the Kent Messenger Series has become the country’s biggest-selling weekday weekly newspaper with a circulation of 41,410. KM Group editorial director Ian Carter said: “We are lucky to have such a dedicated and talented senior editorial team overseeing our newspapers, websites and radio stations. “This move means Bob will be able to devote more time to developing our Medway and north Kent portfolio, which is one of our biggest and most competitive markets. 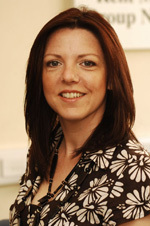 A former deputy editor at the The Echo in Essex, Denise has steered the Gravesend and Dartford Messengers to a string of industry awards in recent years, including EDF Energy paid-for weekly newspaper of the year in 2006 and 2009. Women editors! Whatever next woman priests or giving them the right to vote? Kent has gone a long way down in my estimation. Well done – chocolate, honey and almond nougat all round!